The social media giant Facebook has updated its messenger app to make it more camera focused and added 3D masks and artwork suggestions. The company has rolled out another great feature to the app group video call. 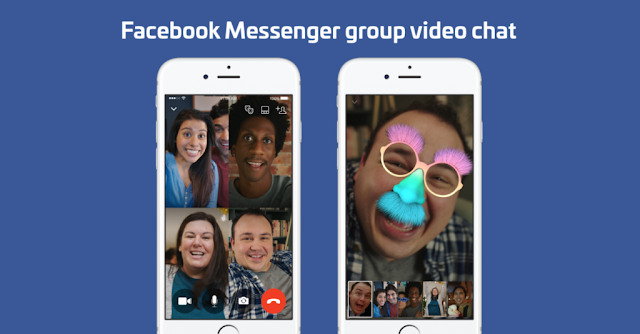 This feature was requested for some time but Facebook finally launched group video chat for Android, iOS and Web version. Christmas is just a few days away so this feature will allows you to start a group video chat with your family and friends. Facebook said that 50 people can join in the chat via voice or camera but users can see up to six people at a time. If there are more than 6 people on the call then the dominant speaker is shown to all others. To make a video call on the group, user have to go to an existing group, or create a new group then tap the video icon at right side of the chat window. Facebook also rolled out a feature that will allows users to add background colors to their text only posts. To add colors to your post, you need to tap on the status bar and then choose from the colors including gradient option as well. This feature will not work for links, images and video posts.